I hate to break it to the current Intel Skull Canyon (NUC6i7KYK) owners, but your system has been replaced by the newer Intel Hades Canyon models. Intel will be offering Hades Canyon NUCs in two flavors. You have the 100 Watt NUC8i7HVK (with Vega M GH graphics) that has an MSRP of $999 for the barebones kit or for those that don’t need something so powerful or expensive there is the 60 Watt NUC8i7HNK (with Vega M GL graphics) at an MSRP of $799. Both the NUC8i7HVK and NUC8i7HNK are going to redefine what is possible in a tiny desktop PC by combining the high-end Intel Core-i7 CPU with an AMD Vega M GPU alongside. 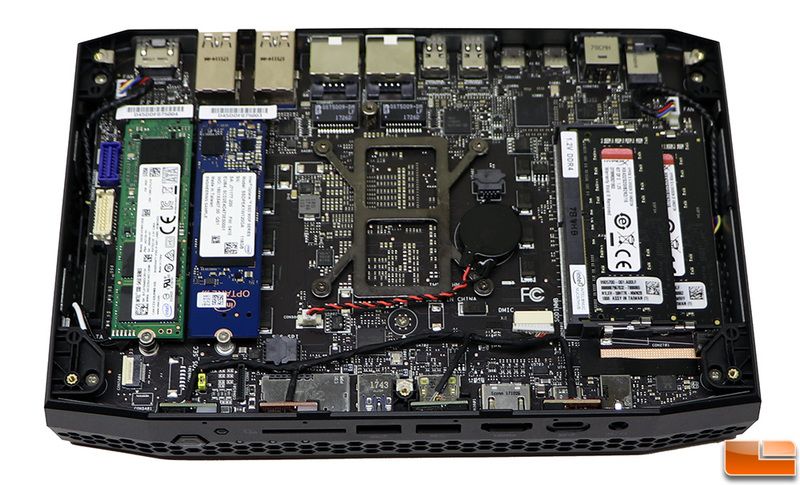 The model that we’ll be taking a look at today is the flagship 100 Watt model called the NUC8i7HVK. This model has an Intel Core i7-8809G ‘Kaby Lake G’ 4-core, 8-thread processor that runs at 3.10 GHz base clock with a 4.20 GHz max turbo frequency. This processor has 16 PCIe lanes, however eight of those lanes are permanently dedicated to the Radeon Vega M GH GPU that is embedded onto the same PCB as the processor. 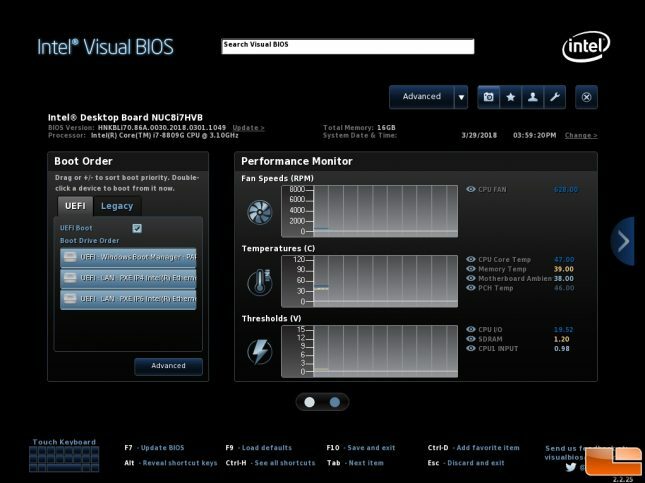 The AMD Radeon Vega M GH GPU has 24 compute cores running at a base clock of 1063 MHz and a boost clock of up to 1190 MHz. 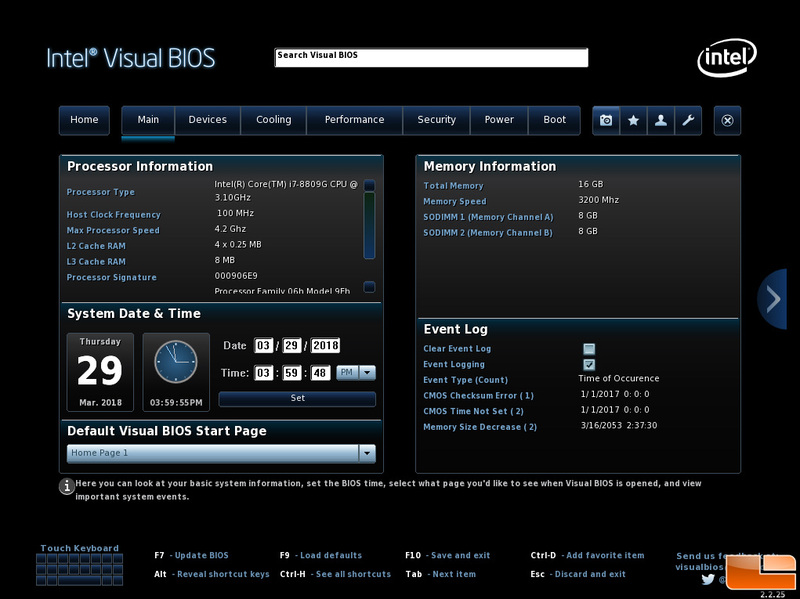 4GB of HBM2 memory running at 800MHz on the 1024-bit memory bit allows for 204.88 GB/s of memory bandwidth. The nice thing about this discrete graphics solution is that Intel left the processor graphics intact, so you still have Intel HD Graphics 630 (350 MHz base/1.1 GHz boost) available for use. This means you can connect up to 6 displays off the NUC thanks to the two Mini-DisplayPort 1.2, two Thunderbolt 3 and two HDMI 2.0a front and rear facing ports. If you’ve ever needed or dreamed about being able to run 6 panels from on tiny small form factor system, Hades Canyon is the answer to those needs. 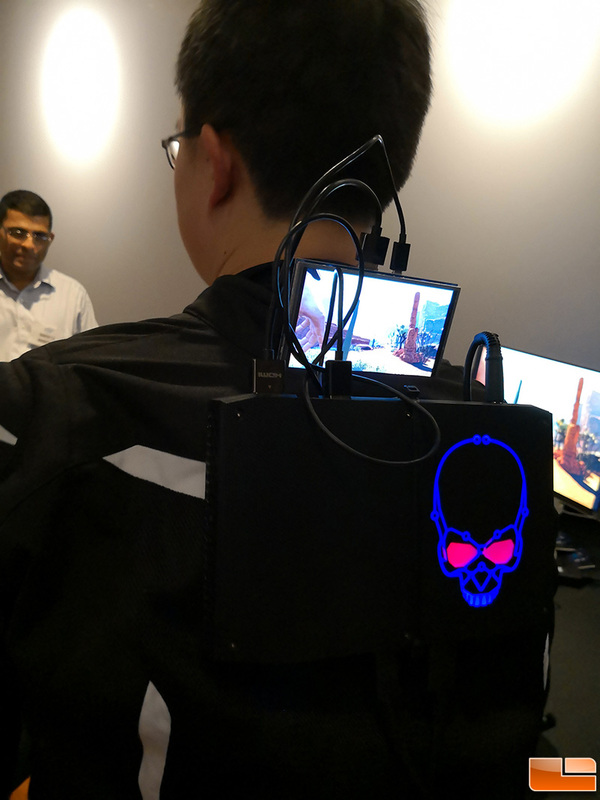 We’ve covered the basics of Hades Canyon back at CES 2018 when it was announced, so let’s get straight into the review. The components in our Intel Hades Canyon NUC Kit NUC8i7HVK add up to just shy of $1,580 for just the hardware and if you need to buy a Windows 10 key you could be up around $1,675 for everything. You can reduce or increase this price by the components you pick to finish this barebone system, but this should give you a feel for a nicely configured system. When it comes to having a nicely configured system, the Intel Hades Canyon has just about every port on it that you’d want. 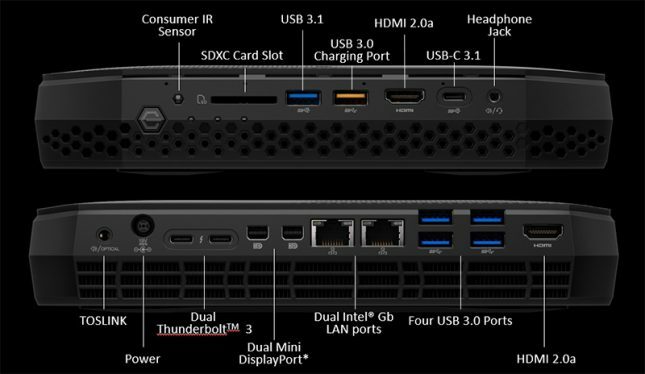 Dual Thunderbolt 3, Dual HDMI (front and rear), Dual DisplayPort, Dual Gbe LAN, 7 USB ports, SDXC Memory Card Reader, TOSLIN. Inside you’ll find two M.2 SATA/PCIe SSD slots for storage drives with RAID0 and RAID1 support. There is also integrated Intel Wireless-AC 8265 with Bluetooth 4.2 to ensure wireless connectivity. It should be noted that the WiFi antenna are both routed internally, so no external dog ears are needed. The Intel Visual BIOS is back on Hades Canyon. Over the years the NUC BIOS has gotten better and this one is pretty robust. You have full mouse support and can update the BIOS without needing to make a bootable drive now. Clicking on the advanced tab will give give you a different main tab and all the tabs that enthusiasts will want to tinker with. 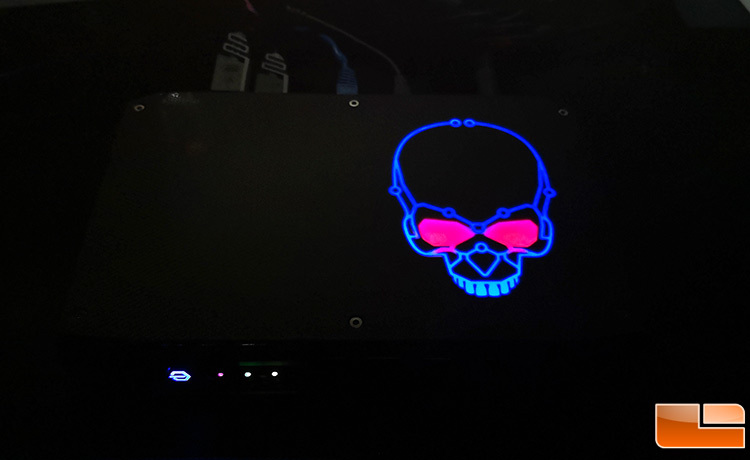 The top of the NUC might look plain, but Intel has decked it out with their skull logo and have finally given you full control of all the RGB LED lighting. 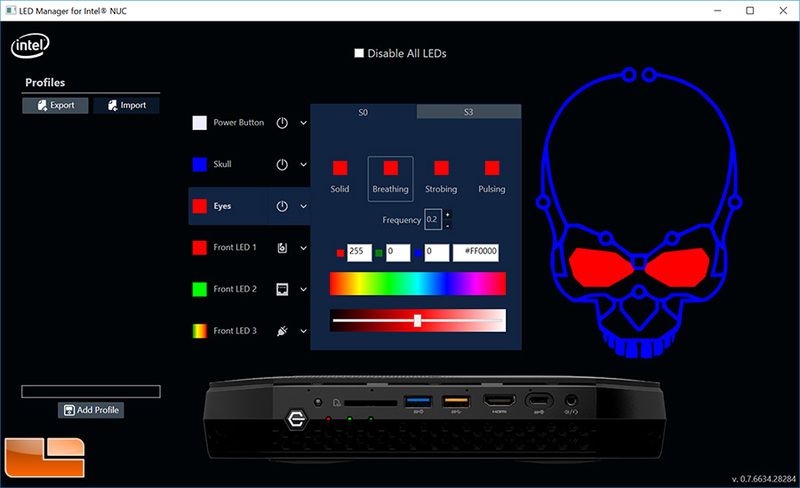 The free LED Manager for Intel NUC software application allows you to control the color of all six lighting zones. You can easily change the color and switch between lighting modes (solid, breathing, strobing and pulsing) or disable all of them. The Hades Canyon NUC measures in at 221mm x 142mm x 39mm and has a volume of 1.2L. That is slightly bigger than the Skull Canyon NUC that was 216mm x 116mm x 23mm and 0.69L in volume. The one thing that you need to keep in mind on Hades Canyon is that the power supply included with the NUC8i7HVK is about as big as the NUC itself! The LiteOn AC Adapter has an output of 19.5V at 11.8A, so this is a 230 Watt power brick. 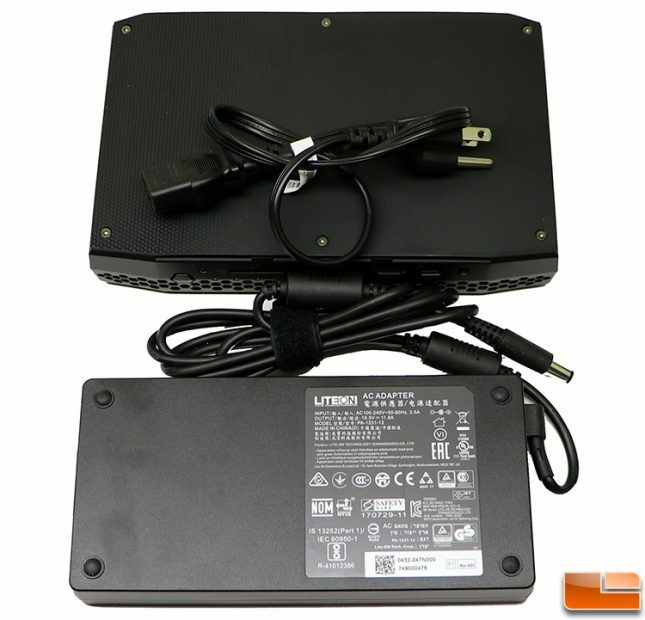 The total weight of the NUC8i7HVK, AC Adapter and power cable is 4.75 Pounds or 2.15 Kilograms. 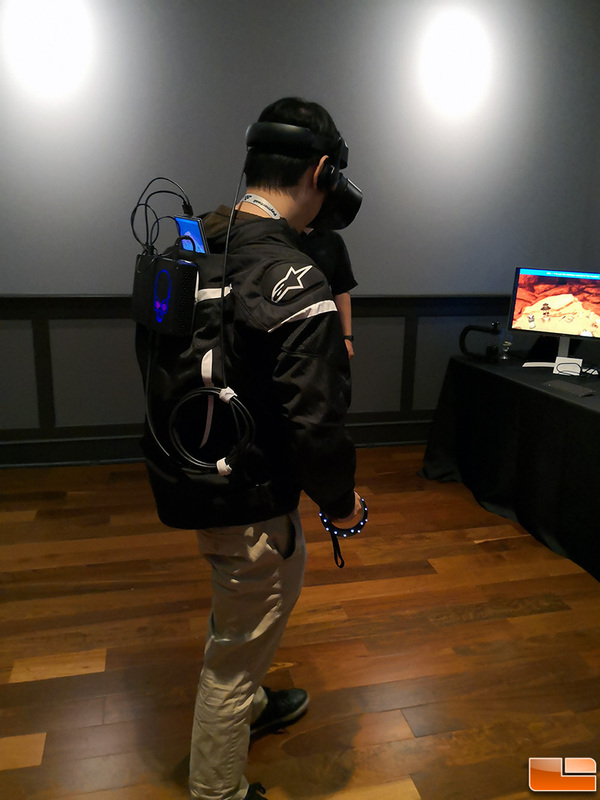 Weight might be a big deal for this model as it can power VR applications. 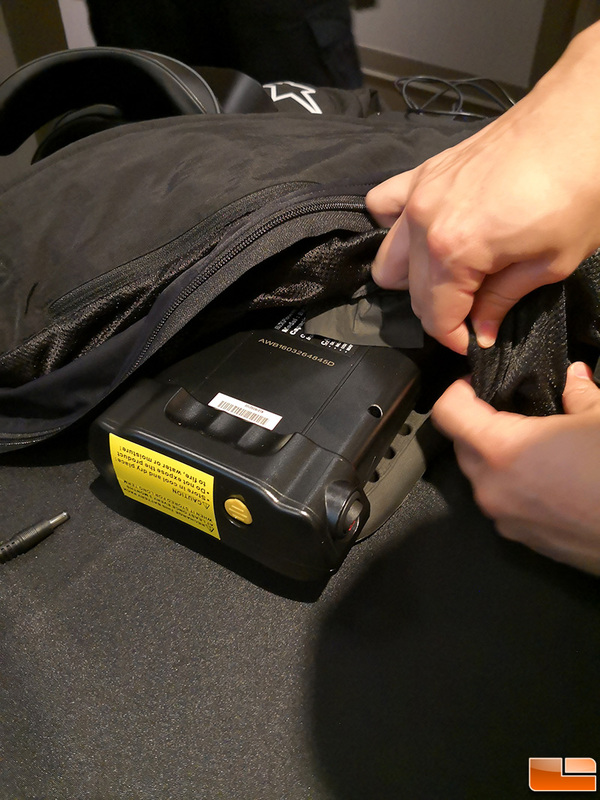 Intel showed us a demo where they took an Alpinestars motorcycle jacket and stuffed it with BixPower Super Capacity (300Wh) external rechargeable battery pack and Intel Hades Canyon NUC8i7HVK. 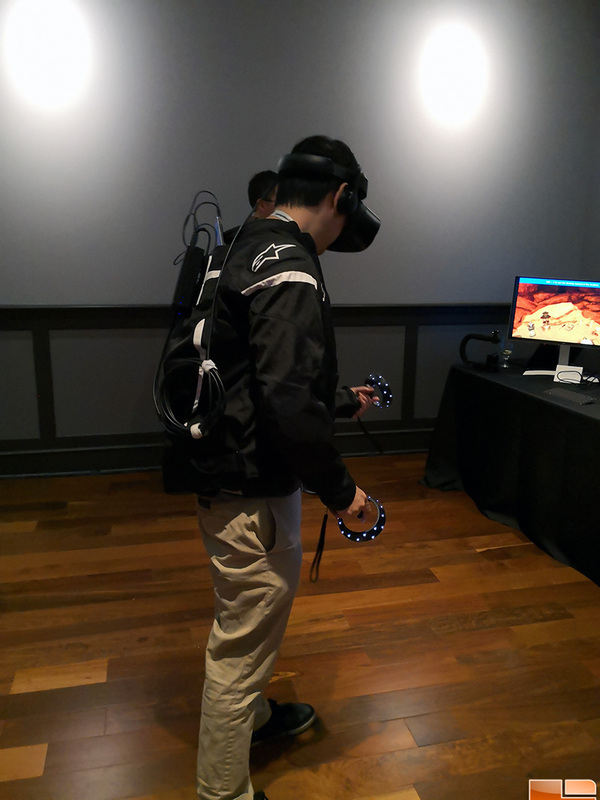 This allowed the user to move around a VR environment for some time. 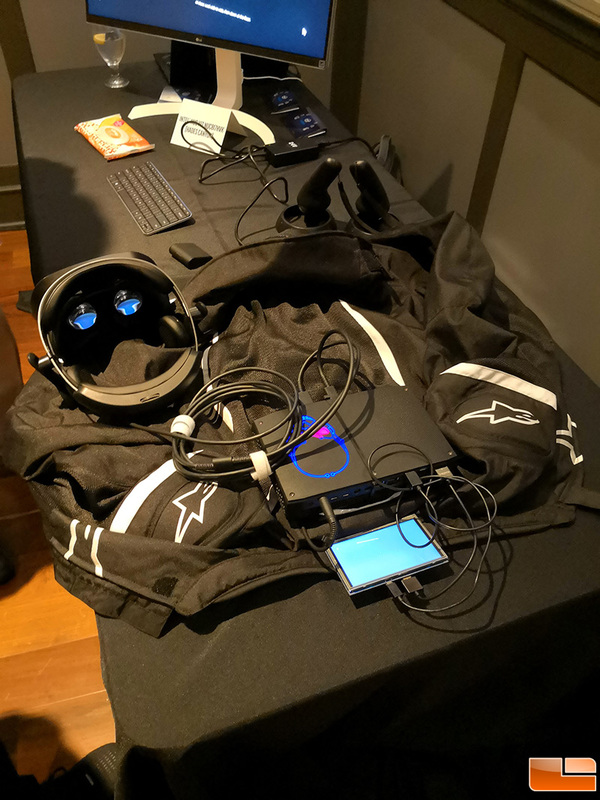 They weren’t sure how long the 300 Watt-hour battery would last, but it was a pretty cool VR demo showing how mobile it is becoming. Let’s see what this system can do!